WINNING: Since 2010, the Bruins have been a staple in the North American Hockey League, enjoying success on and off the ice and becoming a premier destination of Junior hockey players. Boasting a consistently competitive team with back-to-back Robertson Cup Finals Appearances in 2014 and 2015, playing for the Bruins means playing for a Championship every year! FACILITIES: Riverside Arena provides one of the best game atmospheres in Junior Hockey, with a loyal and passionate fanbase that packs the stands on Friday and Saturday Nights. Riverside holds about 2,000 fans with seating on both sides of the rink. Riverside also includes a newly added weight room, so that players don't have to leave the Arena to work out. LOCATION: Minnesota is, of course, the "State of Hockey," and Austin's prime location puts you less than 100 miles south of the Twin Cities, 40 miles Wast of Rochester, MN, and within driving distance of the borders to Iowa and Wisconsin. Due to their centralized location, Bruins players have first class exposure to USHL, NCAA, and pro scouts from across the region. 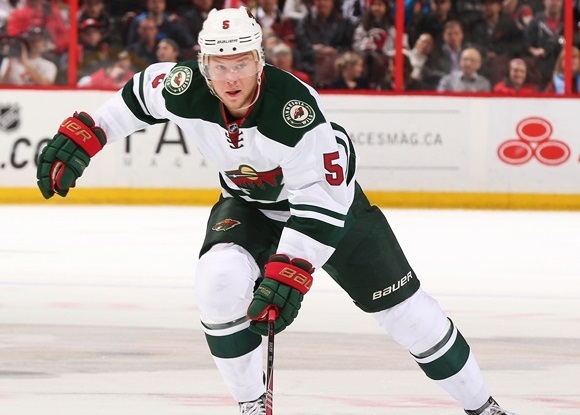 ALUMNI: Several former Bruins have gone on to enjoy success in Professional and Division One Collegiate hockey, including Minnesota Wild defenseman Christian Folin (pictured below) ('12), Bridgeport Sound Tigers goaltender Eamon McAdam ('11), UMass Lowell-Riverhawks forward CJ Smith ('13), and more recently Minnesota Golden Gophers forward Luke Notermann ('16) and UMD Bulldogs forward Jade Miller ('16). CLICK HERE for the comprehensive Alumni Page.